I was just out familiarizing myself with a new lens this evening. 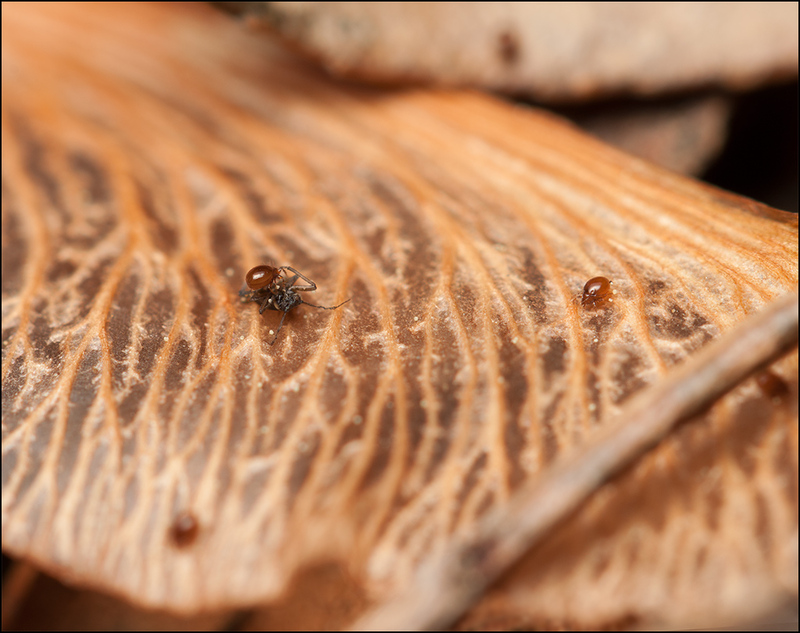 Here's the most interesting thing I found: some tiny mites apparently scavenging on the surface of a maple seed wing. Shot with Canon T1i camera, Canon EF 100mm f/2.8L IS USM lens on 68 mm of Kenko extension tubes, Canon 580EX II Speedlite, E-TTL exposure at 1/250 sec. Manual merge of two images at f/5.6 and f/8. This lens is beautifully sharp, even on tubes like this where it runs at about 1.9X. Nice detail. They look enough like ticks to make me itch though. I guess the little white things are pollen. I'm hearing (and seeing) very good things about this lens, but its price is well up there with other Canon 'L' glass, so investing in it isn't a trivial decision. @Mitch, I think you're right about the little white things. They look vaguely like pine pollen, which the streets are full of right now. @DeVil, I'm pretty sure we're seeing scavenging, not predation. That black bug on its back has been lying around for quite a while, judging from the shriveled antenna. @Cactusdave, I agree completely about the lens -- it's very good, and expensive to match. On the bright side(? ), given the weight of the lens and camera and flash, I can probably write off some of the cost as "exercise equipment". The mites are Cryptostigmata, which are non-predaceous, recyclers of dead organic material. Thanks, Harold. Can you tell from the images whether these critters are adults? Can you tell from the images whether these critters are adults? Yes, due to the degree of pigmentation and sclerotisation. So, we're looking at adult mites whose body length is about 0.4 mm. And now I know what are those little specks moving around on the surface of my compost pile. Typical size, aka seed mites. The smallest Collembola are 0.25mm. Mites can be a lot smaller e.g. the sclerotized Prostigmata such as Scutacaridae, Pyemotidae and Tarsonemidae, the group including some pest species - small but deadly - also itch mites and gall mites!